SALIDA, Colo. (AP) — Despite a severe drought across the Southwestern United States this spring, there should be plenty of water for rafters and anglers in one of the nation’s most popular mountain rivers. 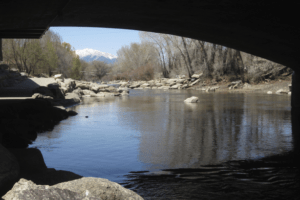 In this April 25, 2018 photo, the Arkansas River flows under a bridge in Salida, Colo., with the snow-covered Sawatch Range mountains in the background. Water from melting snow is rushing into the Arkansas River in central Colorado, thanks to a surprisingly wet winter in the towering peaks where the river begins, state and federal officials say. Some of those peaks, in Colorado’s Sawatch Range, stand just outside the drought’s northern reach, so they collected near-normal snowfall. “It’s not going to be an epic whitewater year for us, but in many respects it’s going to be very, very good,” said Rob White, manager of the Arkansas Headwaters Recreation Area, a state park encompassing 150 miles (240 kilometers) of the river near its source. The headwaters park is a magnet for rafters and kayakers, with rapids rated from easy to extremely difficult. Nearly 50 outfitters are licensed to offer trips there, and industry groups say it may have the country’s biggest commercial whitewater business, although no one agency collects uniform statistics. Anglers also flock to the Arkansas. Colorado’s parks department gave a 100-mile (160-kilometer) stretch in the headwaters park a “gold medal” rating because of the number and size of its fish. “It is one of the state’s outstanding brown trout fisheries,” said David Nickum, executive director of Colorado Trout Unlimited. It’s the longest section of gold medal river in the state, Nickum said. The drought is constricting many other rivers in the south-central and southwestern U.S., including southern Colorado.